Masive capacity, exceptionally well built and cooks beautifully. 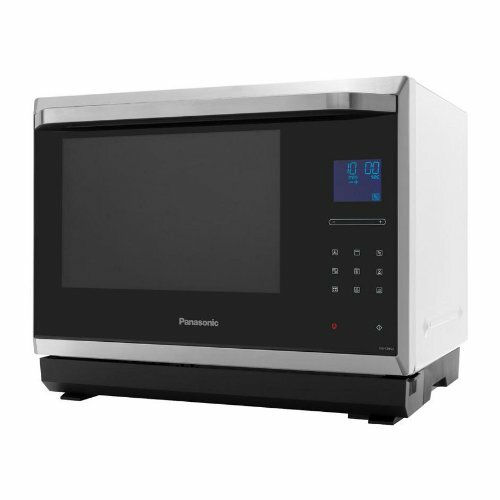 A very well designed combi microwave from Panasonic. Might be slightly too large and expensive for some customers - it still offers very good value for money in our opinion. 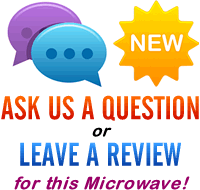 Are you after a new combination microwave, and want one which will be large enough for your family, yet still cook fast and be built to last? Panasonic may just have the solution to your problems with their high end offering - the Panasonic NN-CF853W. Featuring a vast 32 litre capacity, it measures an extraordinary 41cm by 25cm by 32cm inside, and so will accommodate just about any extra large dish we've ever encountered. The overall weight is pretty high, being in the region of 17kg, and so it will need to sit on a sturdy surface. The upside of this is that, as you would expect from Panasonic, the NN-CF853W is well constructed, with every moving part feeling solid, and like it is built to last years of daily use. The exterior is large, and so it will be worth your while measuring your allotted microwave space prior to purchasing to ensure it fits - full specifications are listed at the bottom of this page. The flatbed design means it does not feature a rotating turntable - providing you with yet more room inside. Despite the fact that the food does not move within the microwave, it still heats and cooks evenly thanks to the 1000w of power when in microwave mode. Also included is a 1300w grill, which reaches temperature rapidly. A fairly unique feature of this model is the two tier option - enabling you to cook two dishes at once whilst in convection oven mode - by simply sliding in the wire tray, and selecting the appropriate setting, you can save time and energy by simultaneously cooking different dishes. The air circulates evenly, and both dishes cooked well and were ready at the same time during our test period. It even features an "intelligent sensor" which guesses the weight of your food, and recommends a suitable program - we found this to be surprisingly accurate in practice. Overall we were impressed with the NN-CF853W - it performed to a very high standard, and both the controls and various mechanisms work well and give the impression that they will operate flawlessly for years to come, given the build quality. Granted, this model will not be for everyone - it does cost a lot, and will take up quite a bit of room in your kitchen. For those who want a large top of the range combi microwave, then we would highly recommend this model. A lot of thought has been put into the design, and as a result, it's a joy to use and simple to clean. Quite simply, an incredibly well designed piece of kit, which both looks and functions very well indeed. Granted, it is a sizable investment, but over time we believe it will prove to be good value for money. Overall we highly recommend the NN-CF853W - a high performing combination microwave. Can this microwave be housed in a unit? I am looking for a combination microwave to fit into a kitchen cupboard. I have been given the dimensions of 500mm wide 436mm high and 300mm deep. Ideally I would like a combination microwave but I cannot find one shallow enough. I am sure there is a grill microwave out there but I cannot find one either. Your dimensions are really helpful but I am not sure which measurement they refer to – w, h, d.
Any help you could offer would be most appreciated. Can you please tell me the larger dimensions of the Panasonic NN- CF853W please.